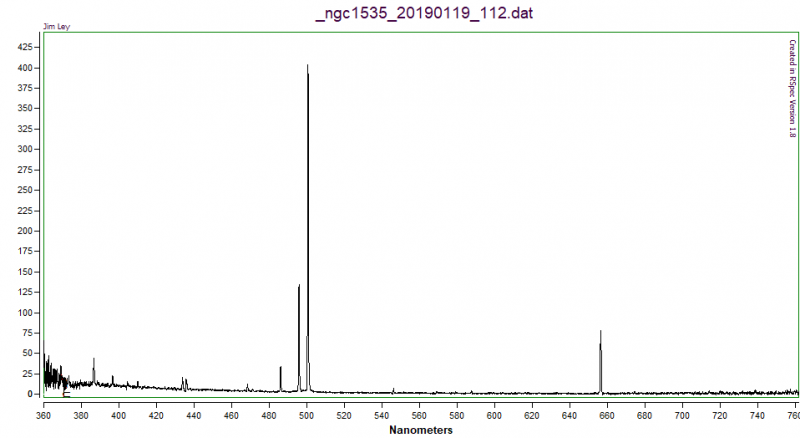 I recently acquired a 10 μm slit for my ALPY and I'd like to share a few experiences. 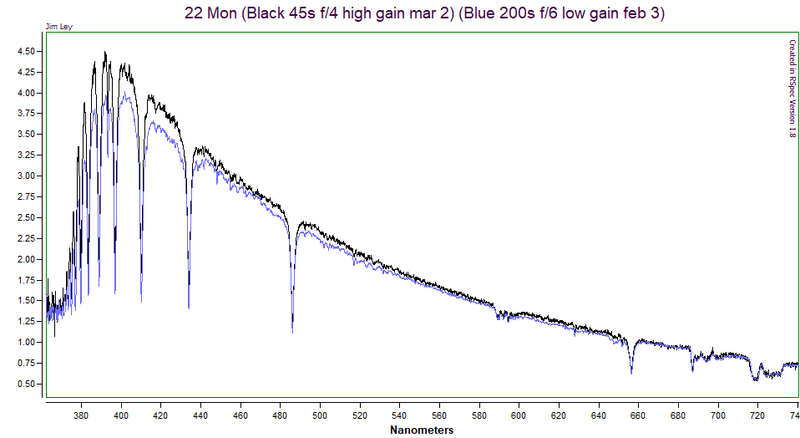 First I compared the ALPY calibration module spectrum with the 23 μm slit (black) to the 10 μm slit (blue). The smaller slit afforded narrower peaks and better resolution. I did have to double my exposure time for the flats. 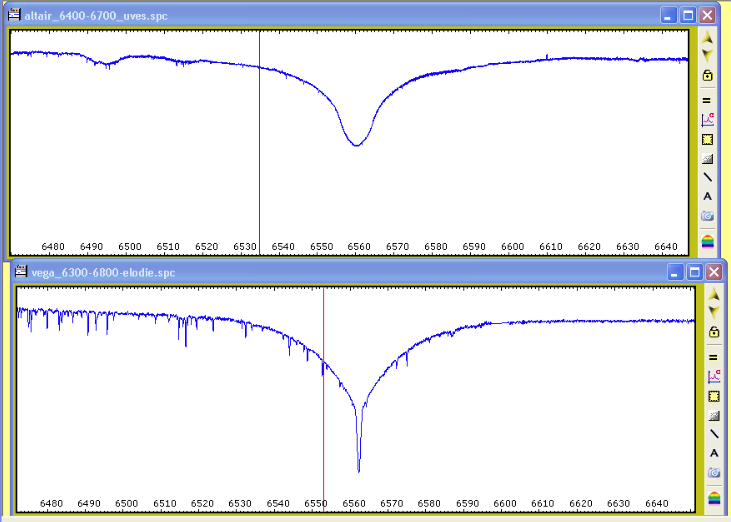 I think that the calibration spectrum and the stellar spectra are about the same exposure time. So I’m getting maybe double the resolution for a little more time. I found that focus was more difficult to achieve with this slit. The ends of the slit seemed less in focus. I think this is normal. I had hoped that this slit would improved my calibrations with ISIS, but I found this was not the case. Many times I couldn't calibrate the spectra below 1 RMS. So basically, i gave up trying to calibrate and just processed the spectra. I think I have an idea why this is happening. Mira was looking pretty good. If I had looked very carefully I would have noticed the peaks were getting a little wider in the bluest Balmer lines. Xi Persei was new to me. I'm not too familiar with O-type stars. Calibration was bad and the blue end wasn't looking good. 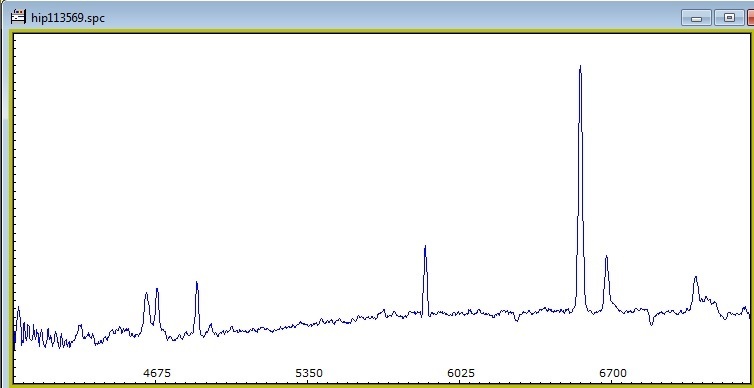 But I was able to see some emission peaks and good resolution for some absorptions. Zeta Tau is a Be star with V/R variability in the H-alpha peak. 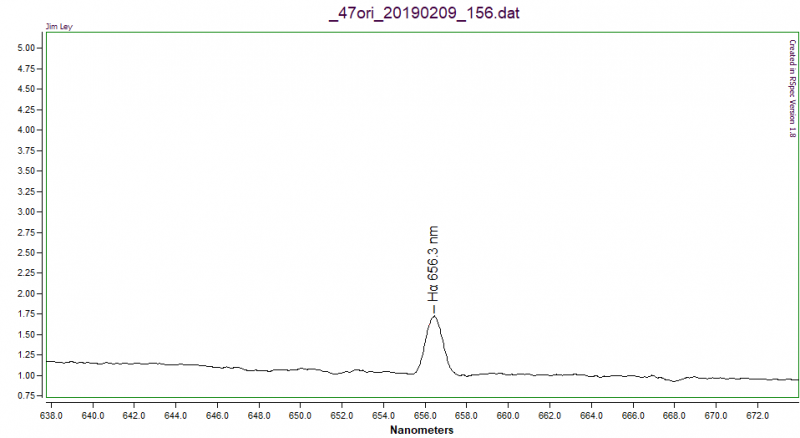 Myself and others have seen this split with a 23 μm slit but it was more resolved with the 10 μm slit. T Tauri is a pre-main sequence star. I had never studied this spectrum before. Things looked pretty good in the red end with nice resolution. The calcium lines and the Balmer lines shouldn't be doubled like that. At first I couldn't understand how an optical aberration could produce single peaks in the red end but double peaks in the blue end. Then I read that coma is wavelength dependent. So basically, I think that I wasn't in the "coma free" part of my field of view and the effects became more obvious toward shorter wavelengths. This is partly why I had a harder time focusing and why my calibration was worse. I'm going to try to collimate my telescope more carefully. Perhaps I'll even make an artificial star with a mercury UV lamp to do my star test in UV. I'll also take more care that my star is on the slit in the "coma free" zone. Thanks for reading. Any suggestions are welcome. Edited by Organic Astrochemist, 13 January 2019 - 11:21 AM. The ALPY optics are achromatic so sharpness across the wavelength range will always be a compromise which is probably exagerated by running outside the original design parameters using such a narrow slit. Which line(s) did you use to focus the spectrograph? The optics design is different from a normal achromat optimised for visual use. 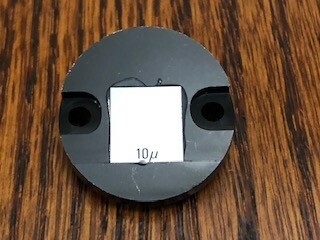 They are optimised specifically for UV/visual rather than IR so the recommendation from Christian Buil who designed the optics is to focus at the blue end, which should also give good focus in the visual region, and accept some compromise at the IR end where resolution is generally less important. Edited by robin_astro, 13 January 2019 - 01:01 PM. It might be worthwhile checking other stars with narrower lines. Edited by robin_astro, 13 January 2019 - 01:35 PM. Thank you Robin. As so often, you are absolutely correct. 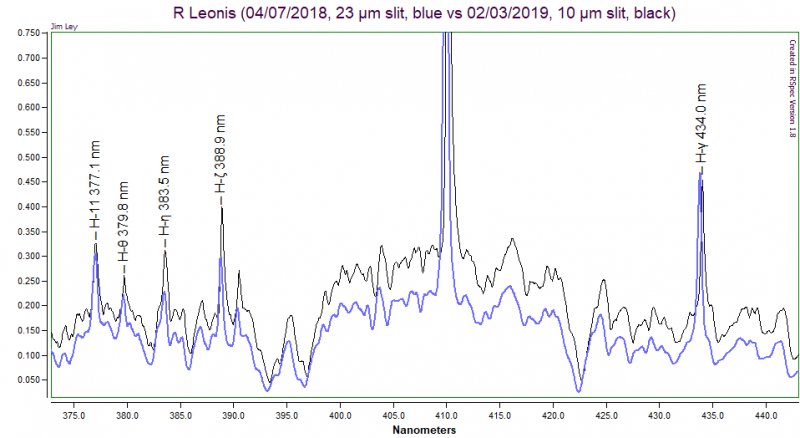 Because the argon lines are so prominent in the ALPY calibration module, I originally tweaked the focus around those lines, in the extreme IR of my spectra. I now see that the UV is out of focus. Not only are the UV lines very weak, but the majority are, in fact, blends of multiple lines. By studying very carefully the Spectral Atlas of Richard Walker at R=4,000 I found a few single lines ~450 nm to focus on. 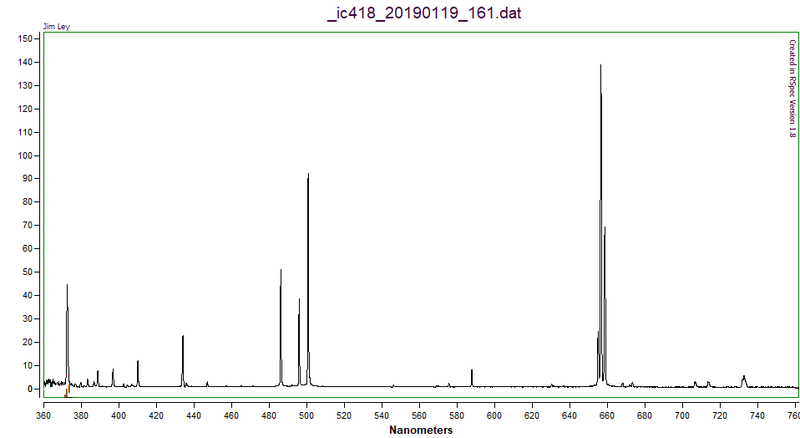 I was able to vastly improve the blue end of the spectra with only a slight degradation of the far IR (in my small spectra). I greatly increased the exposure time and saturated some of the lines on the red end. I was considering buying a new camera, an ASI 183MM, to extend my range further into the IR, but I don't think I'll do that now. I am also considering upgrading to an 8" f/4 telescope. I have read Christian Buil's somewhat recent posts confirming that the ALPY can handle f/4. Can you think of any disadvantages of f/4? I am a little afraid the the coma/collimation issues. Will the resolution be adversely affected? 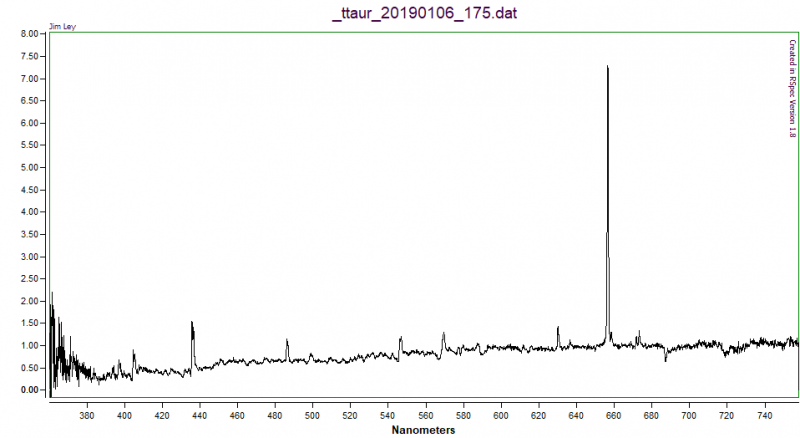 Personally, given my limited observation opportunities, I think that the ability to record more spectra in less time will be worth it. I sure have had a lot of fun with my little $200, 6" f/6 telescope. 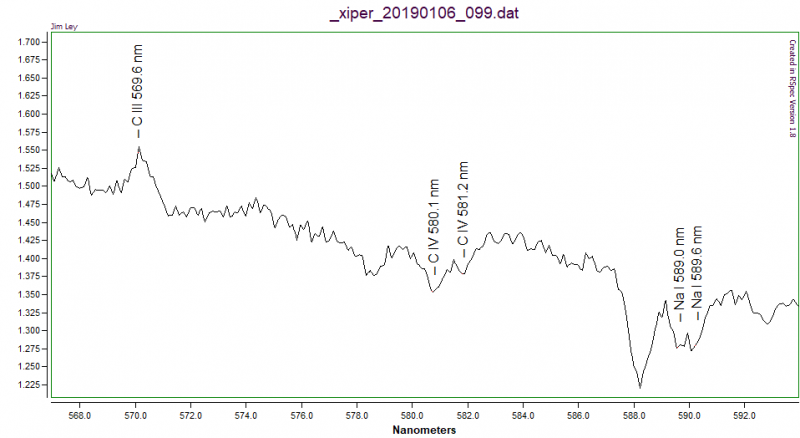 Christian Buil's UVEX spectrograph looks like a game-changer for amateur spectroscopy. If I get one, I'd probably get a different camera than my small 7.4 mm sensor with tiny 2.4 μm pixels (I have also had a lot of fun with my ZWO ASI 178MM camera). I also considered that some of my split peaks were authentic, but then I noticed the same splitting in many different objects and the corresponding velocity, ~400 km/s, was always far from literature values. I'm eager to try again with better focus. Thanks, as always, for all your help and inspiration Robin. Edited by Organic Astrochemist, 14 January 2019 - 11:55 PM. Glad it solved the problem. Being able to use a 10um slit with your superb seeing is really pushing the ALPY resolution into new areas. What resolving power is ISIS reporting now? Yes Christian published some ray tracings for f4. With slit spectrographs, the telescope optical aberrations do not affect resolution provided the star image fills the slit, so poor collimation will just affect throughput. Off axis coma in the telescope, which is likely to be significant with an uncorrected f4 Newtonian, does not matter for slit spectroscopy of stars which are normally measured on axis where there is no coma and Christian's ray tracings show there is no vignetting provided the star is on the optical axis. 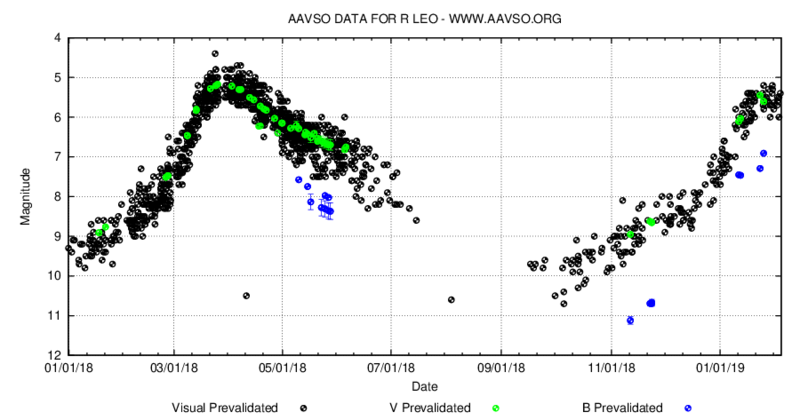 The aberrations in the spectrograph optics increase at low f ratios though so note Christian's caveat that any loss of sharpness of the spectrum and hence resolution is only insignificant provided the slit width is >= the standard 23um and he implied that there would be some loss of resolution moving to f4 using a 14um slit which he sometimes uses. 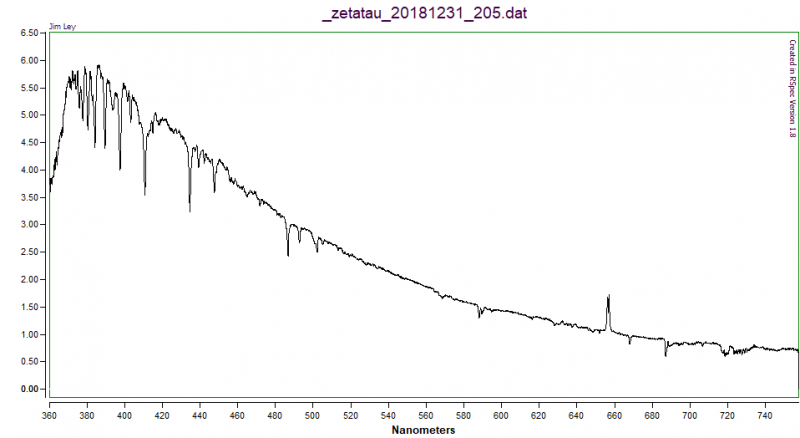 I would say that the conclusion is that you would get an increase in sensitivity moving to the larger,faster aperture (perhaps around 1 magnitude) but you might lose some of the extra resolution you have gained moving to the 10um slit due to increased aberrations in the spectrograph optics. Edited by robin_astro, 15 January 2019 - 09:08 AM. What a difference good focus can make! Calibration was easy and I got an RMS value of 0.2. I didn't completely optimize my instrument response. But the great news was the resolution power according to ISIS: 1155.2! I hope that might be something of a record for an Alpy. 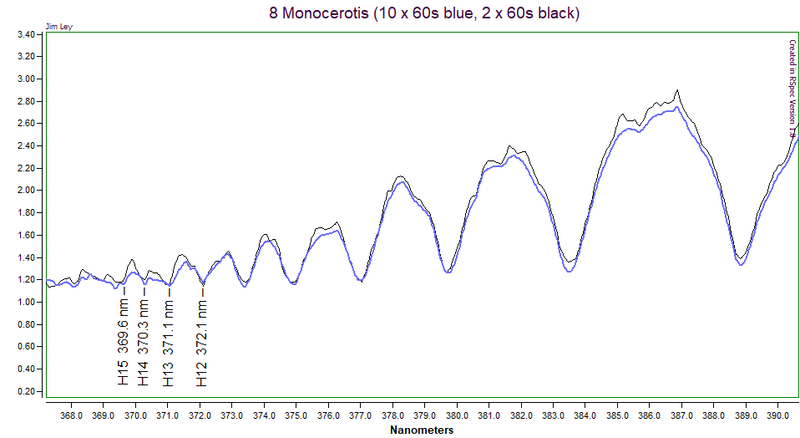 This was my spectrum of 8 Monocerotis (A5IV) and an A5V reference shown in blue. The number of Balmer lines prompted me to do a little research. The higher order Balmer lines become spaced closer and closer together until eventually they merge into a continuum. This is known as the "Balmer edge". 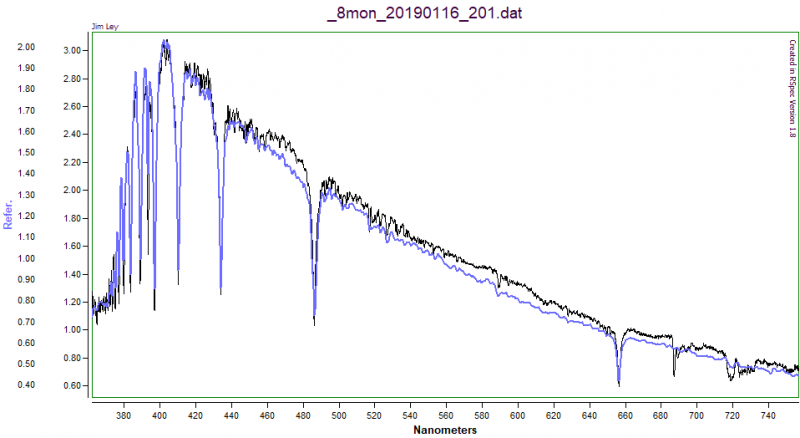 Because of Stark broadening, the limit on the number of Balmer lines visible in stellar spectra is much less than what might be possible in a laboratory discharge tube. The position of the Balmer edge is sensitive to surface gravity, magnetic fields and turbulence, among other factors. The H15 line at 369.6 nm might be close to the Balmer edge. 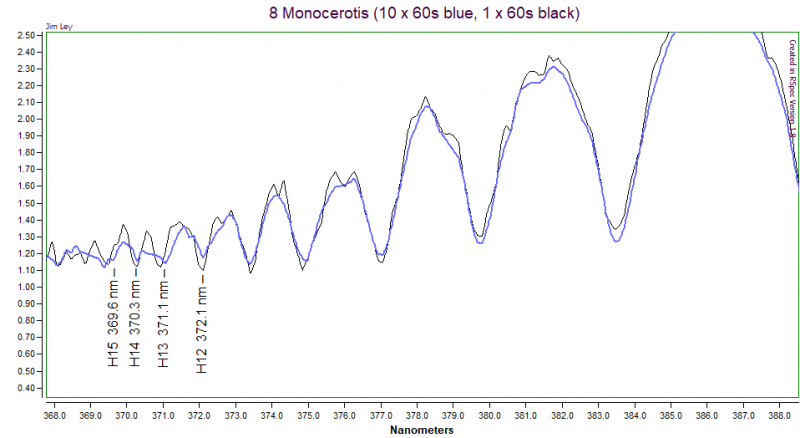 Initially I had taken the spectrum as a reference star to observe V694 Mon. 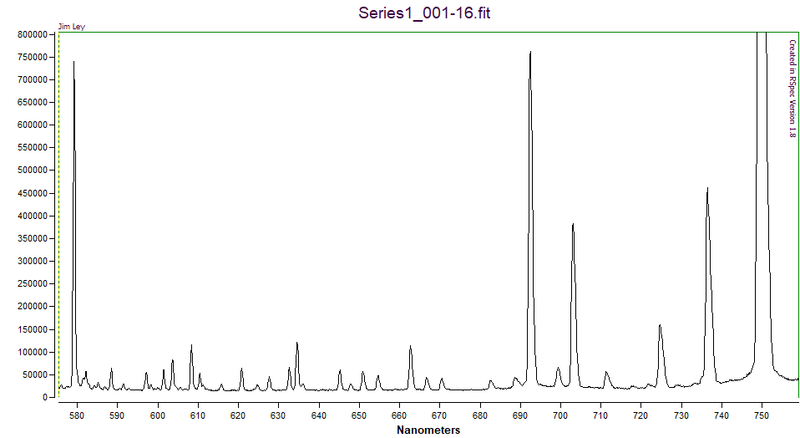 Counting the higher order Balmer lines might add additional interest to such reference spectra. I'm not sure of the relationship of the Balmer edge with luminosity class or stellar variability. One downside to such a small slit is the decreased light entering the spectrograph. I think it's too complicated for me to do a valid photometric comparison, but I am going to investigate the effects of reducing the total acquisition time on my spectra. Here is the comparison between the spectra of 8 Mon acquired by averaging only two 60s exposures (in black) and ten 60s exposures (in blue). As expected, the resolution is unaffected at 1155 for both, but the signal to noise ratio is lower in the former. 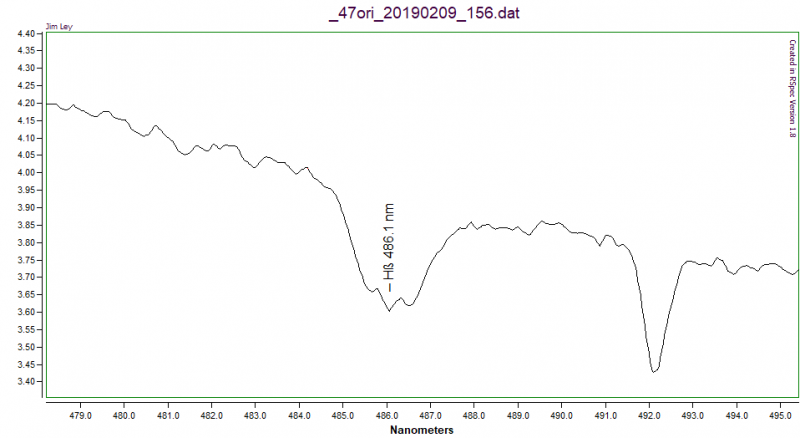 To me, the consequence of this lower S/N is that the H15 line at 369.6 nm is not visible. I understand that for a reference star several acquisitions are desired to minimize the effects of random variation that are possible due to small sample size. 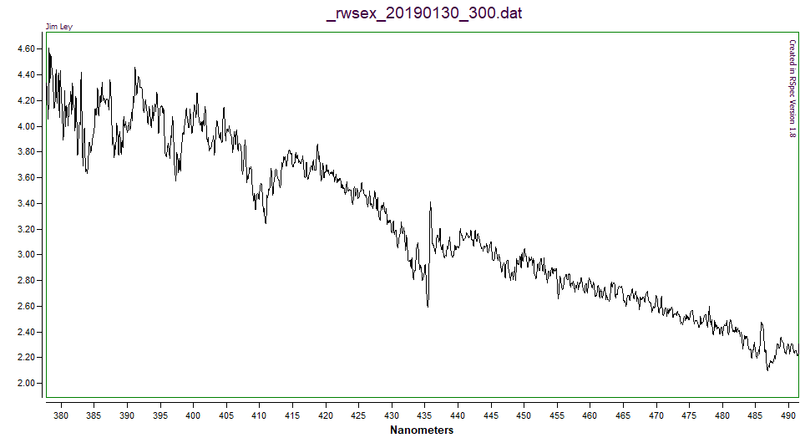 However, my camera is 14 bit and I think that for a reference spectrum maybe even 60s, or less, should be sufficient as suggested by 1 x 60s spectrum (black line). 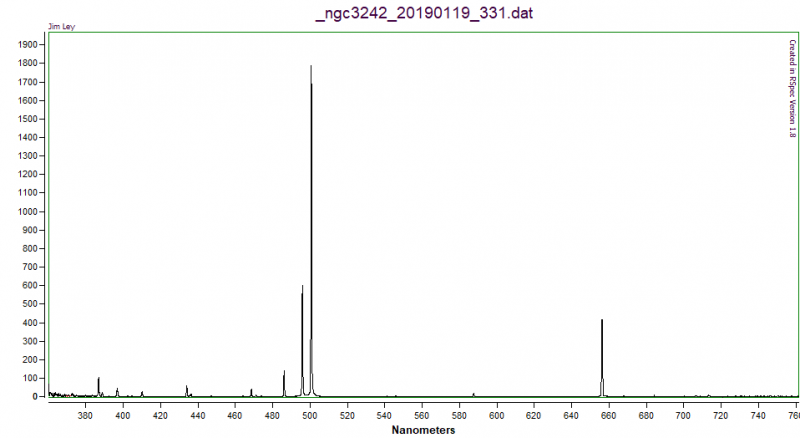 I think that is not much longer than I would have needed using a 23 μm slit. 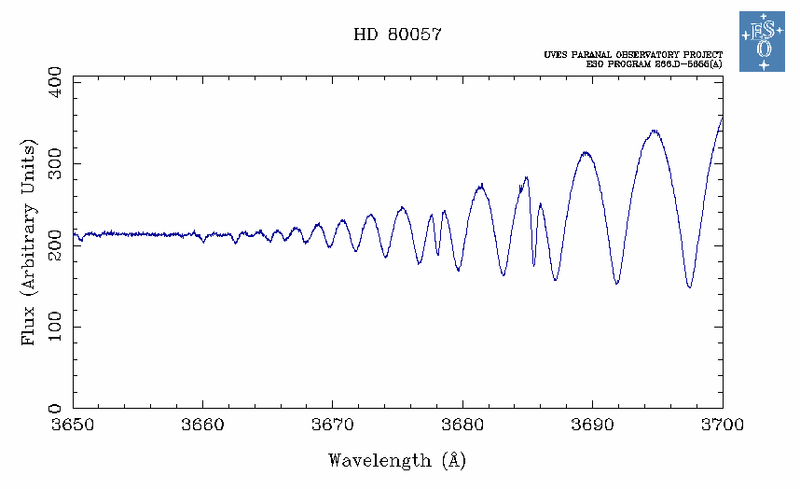 600 seconds is probably not an efficient use of spectroscopy time for a reference star. The idea/optimum signal to noise ratio may depend on what one wants to observe in a spectrum, but what is required for flats or a reference spectrum? Edited by Organic Astrochemist, 16 January 2019 - 11:07 PM. An interesting test for slit losses (both due to the star overspilling the slit and guiding errors) is to take the same target with and without the slit (This can be done easily with if you have the ALPY photometric slit with the narrow and wide areas.) The results can be surprising. 50% loss is not uncommon. It depends on the brightness of course but I usually spend at least 5 min total exposure time on a target. For the targets I am looking at 30 min is more common and 2 up to hours for faint targets, beyond which I find there is not much to be gained. I normally average at least 3 sub exposures for each spectrum I take so I can estimate the effects of any variability and check if any unexpected interesting feature are common to all three exposures. 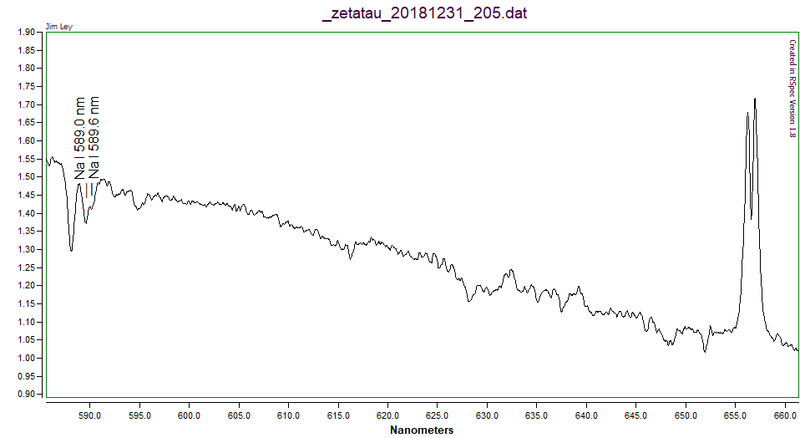 You don't need a particularly high SNR for a reference star as you are smoothing it to produce the instrument response but reference stars are normally bright so I would say an SNR of 100 is a reasonable target. I find exposure times a bit confusing for CMOS cameras where you can alter the gain but for bright objects with a slit spectrograph sqrt(number of electrons per bin) is a good approximation to the SNR as the contributions to the noise from the sky background and camera are small. To get the electron count, You need to multiply the counts per bin by the camera gain e-/ADU so with my ATIK camera a count per bin of ~40000 counts gives me an SNR of ~100. Take care with CMOS cameras though as the capture software may be multiplying the counts to make it look like a 16 bit camera ! With ALPY flats it is important to combine a large number of well exposed (but not anywhere saturated) flats. The reason is the counts in the flat are very low in the UV where the lamp output and camera sensitivity is low (I average at least 30 well exposed flats with my 16 bit camera. I am not sure what the equivalent would be with a CMOS camera.) It does not take long to take a set of flats though and the ALPY is stable enough such that only one set per session is needed. 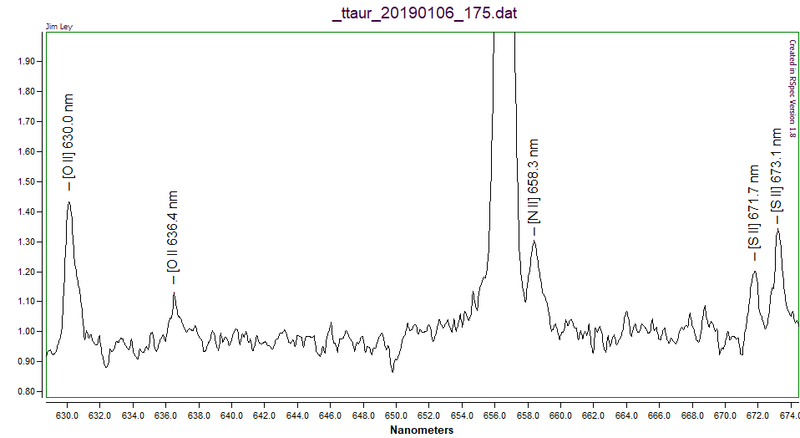 As a way of practicing I can recommend trying measuring a few stars with know spectra (eg MILES) and seeing how close you can get to the professional spectra. There are some of examples of this sort of exercise on my website here. Edited by robin_astro, 17 January 2019 - 08:37 AM. Now things are starting to get fun. I can just cruise around taking spectra and learning about all kinds of cool things. I took some spectra of planetary nebula. When I calculated the excitation class my value was too high, but, as I read, that's probably because my spectrum included the central star. With NGC 3242, I purposely moved the slit away from the center. This avoided the central star, but probably also avoided the region of highest excitation and my excitation class was a little low. This is lowest excitation class, 1 and my results agreed with this, even though I also passed through the central star. This is a young, small planetary nebula. 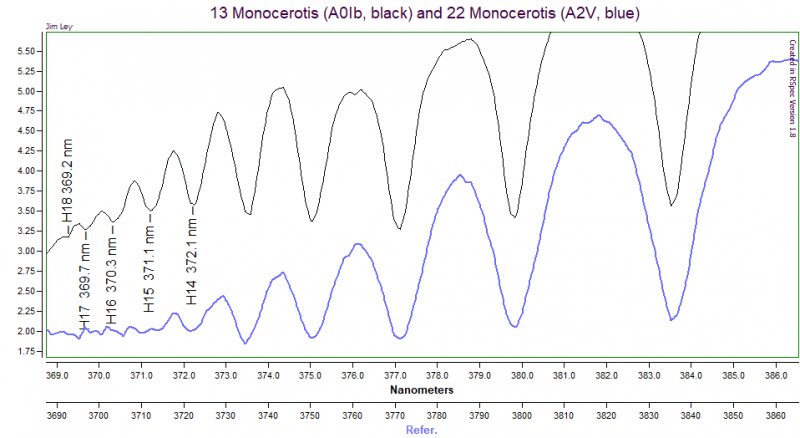 Here’s a comparison I made between an A0Ib star and a main sequence A2V star. 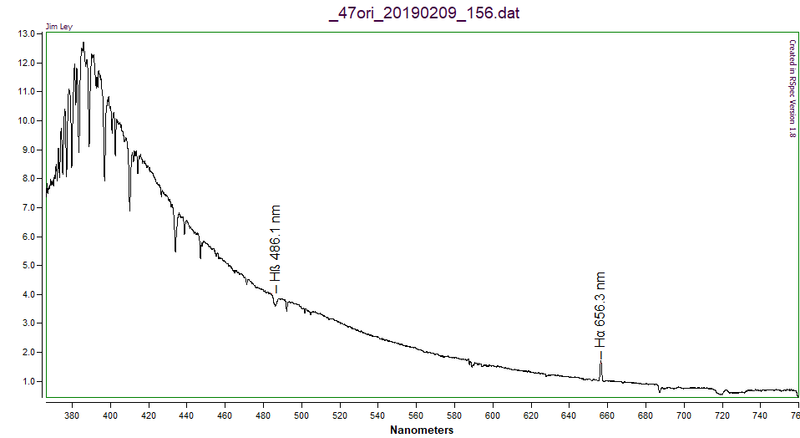 The lines are noticeably wider in the smaller, more dense A2V star, but the effect on the higher order Balmer lines and the observable Balmer limit is quite striking. The rapid rotation of Vega does produce a spectacular spectrum. I can see even slightly broader absorption’s in my spectrum of RW Sextantis. This is a cataclysmic variable with a hot white dwarf. The inclination angle is about 34 degrees. 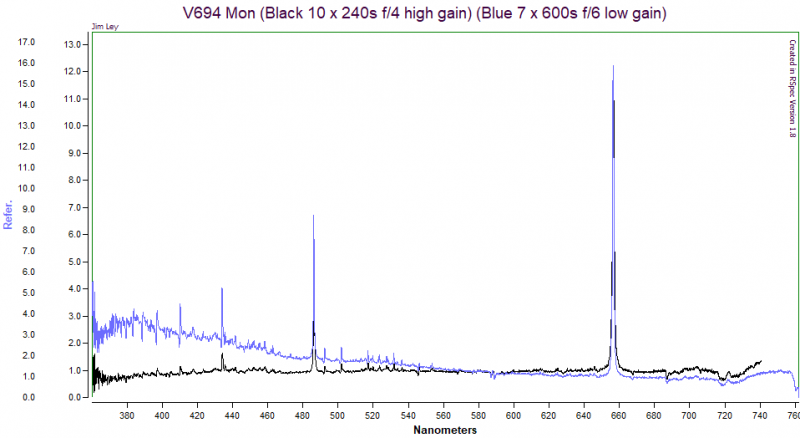 It’s only mag 10.7 and emits a continuum mostly in the UV. My light pollution lines are brighter than the star. There is a subtraction artifact at 436 nm. 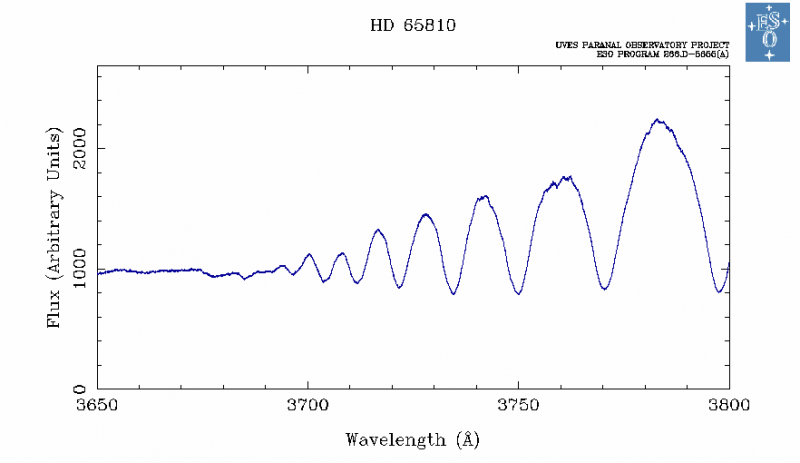 The broad absorption lines are from the white dwarf. The small emission peaks in the centers are the result of material accreting from the secondary star towards the white dwarf. Here I have labeled the Balmer lines. I started acquiring spectra of 600 s and then I went to bed. 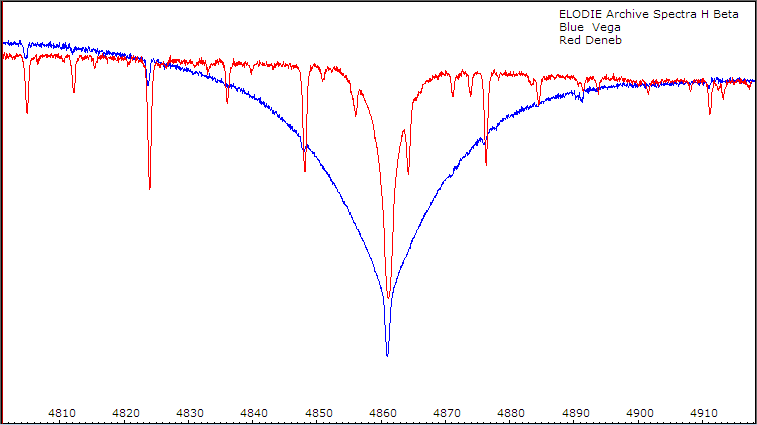 Not surprisingly, I could see my spectra getting redder as the target sank lower and lower in the sky. How many degrees away from zenith can one go before needing to take another reference spectrum? Is there a maximum useful integration time? How many degrees away from zenith can one go before needing to take another reference spectrum? Vega is indeed rotating rapidly but we see it pole on so Vsini is small. The difference between Vega and Deneb here is almost entirely due to pressure broadening. For an example of the effect of rotation, take a look at Vega and Altair at high resolution. 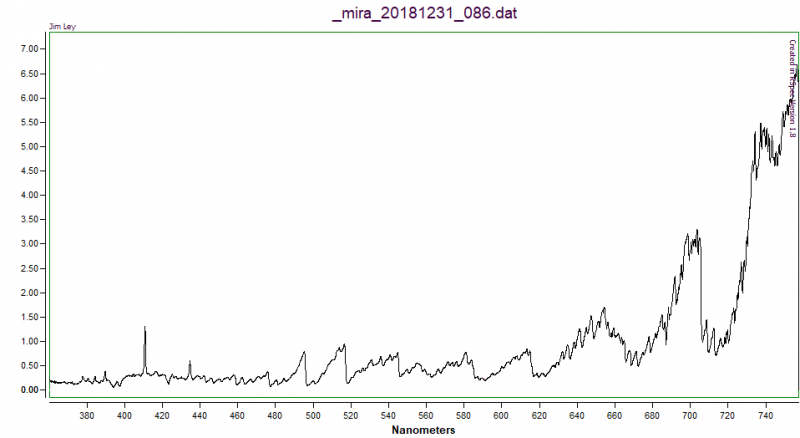 I have always been fascinated by Mira variables. They pulsate with periods from 50 - 700 days as they move along the asymptotic giant branch. These pulsations create shock waves that release large amounts of energy and excite hydrogen higher up in the atmosphere, ultimately causing emission lines. Here is the light curve for R Leonis (thanks AAVSO). And here is a comparison of the blue end of the spectrum from 2/3 this year with 4/6 from last year (roughly the same phase in the pulsation cycle). Pretty much the same Balmer lines can be seen. 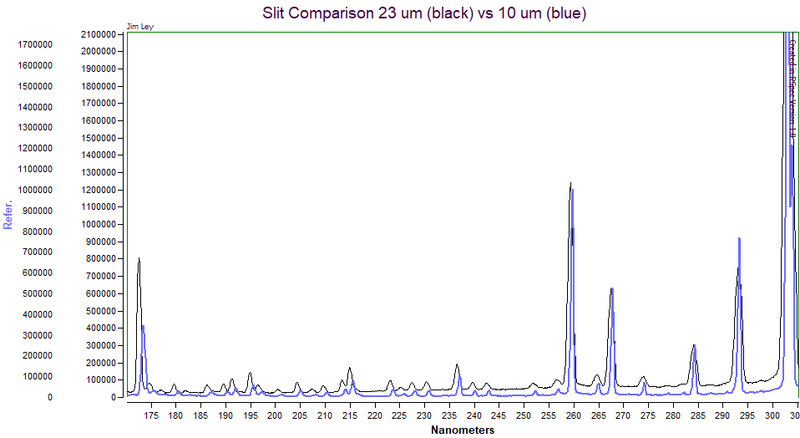 The big difference, for me is that last year I used the 23 µm slit (blue) and this year I have used the 10 µm slit (black). 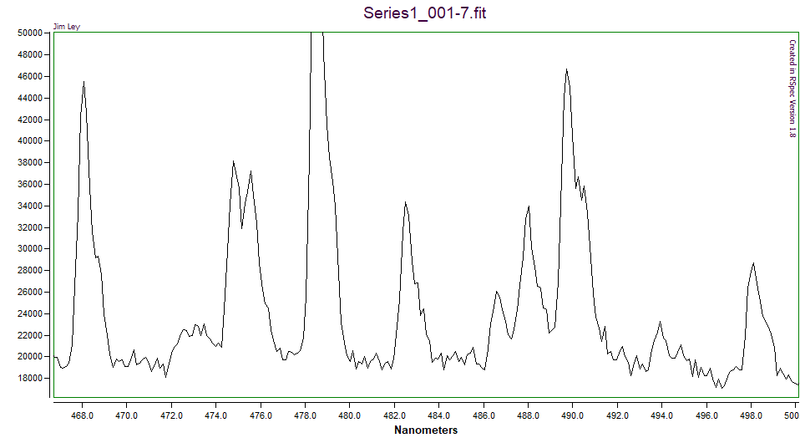 Someone told me that, to first order, emission line widths are independent of spectral resolution. That seems to be roughly true in this case. 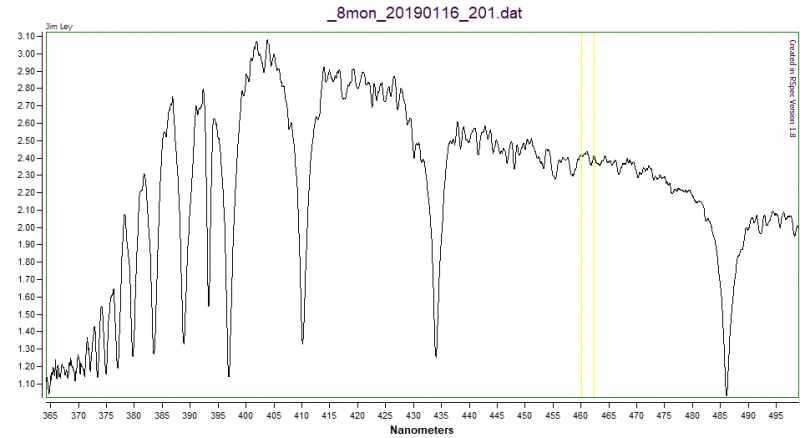 In general the resolution has gone from ~550 to ~1100 and there are some cases where this makes a noticeable difference in what one can observe in a spectrum. 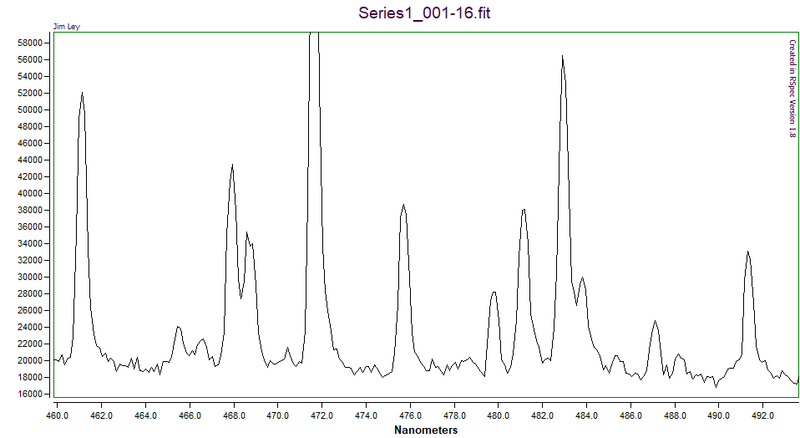 But the biggest difference that I have found is obvious in the comparison of these spectra. With the 10 µm slit (black), the calibration is always spot on, often less than 0.1 RMS. 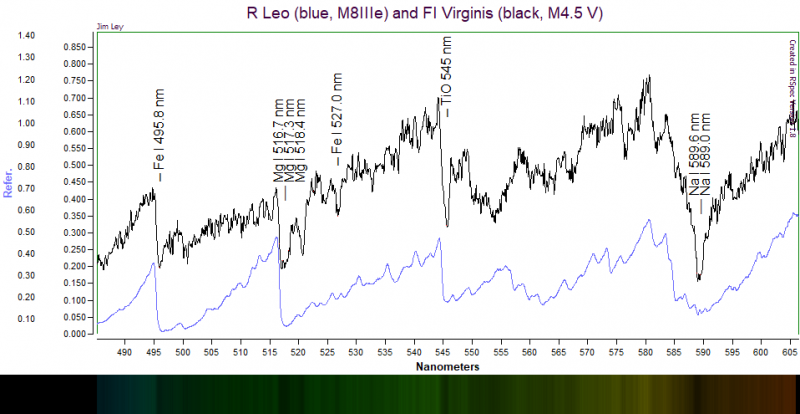 That means that the emission peaks are at exactly the wavelength they are supposed to be. Whereas with the 23 µm slit (blue), the star might be positioned anywhere inside that large slit, and the calibration was often off. 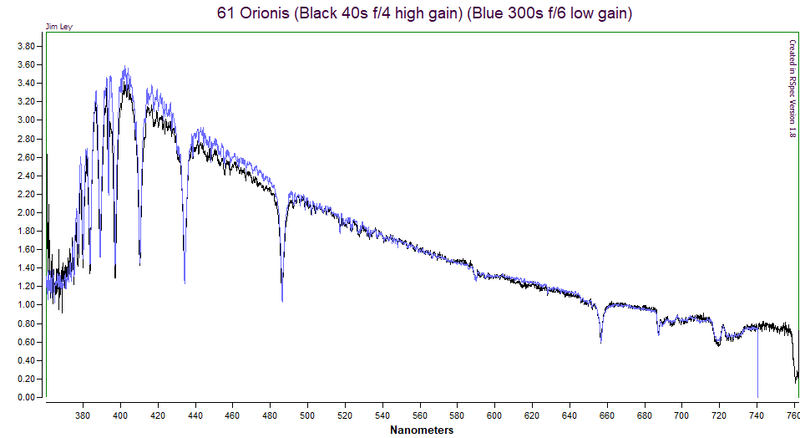 In the blue tracing, all the emission lines seem slightly blue shifted, but I have spectra two days later when they are all red-shifted. 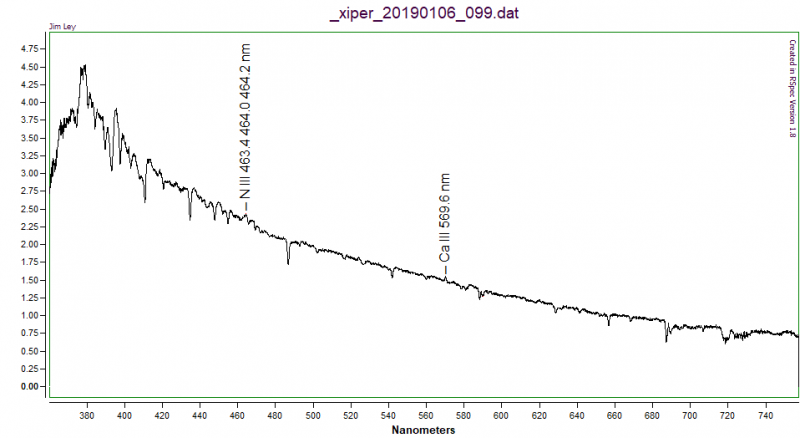 Having the 10 µm slit allowed me to achieve better focus and better resolution, but most importantly for me, it has really improved the reliability and accuracy of the calibration. Once again, the choice to achieve the best possible focus at the blue end, possibly at the expense of the focus in the infrared end seems to be justified in this case. X Hydrae is another Mira variable (there are tons of them). It's also at about the same pulsation phase, but it's fainter, around mag 10 right now. This is a spectra made from 6 x 600s acquisitions. I have an artifact from incomplete subtraction of the sky background. In fact, every acquisition the lines from light pollution increased (could have been my neighbor's lights). I'm not sure if there are any tricks to improving the subtraction of the sky, which in my case is quite bright. 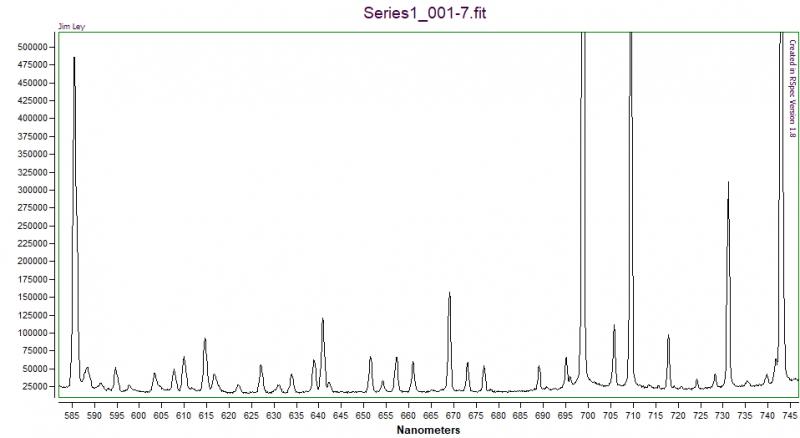 Someone told me that, to first order, emission line widths are independent of spectral resolution. Do you mean Equivalent Width ? ie the strength of the line as measured by the area under the line? This is generally independent of resolution as the height of a narrow line decreases as the width increases due to a reduction in resolution. The width of an emission line (eg FWHM) would only remain ~constant if the width is already greater than the resolution. For example the width of very narrow emission lines eg in planetary nebulae directly reflect the resolution of the spectrograph. 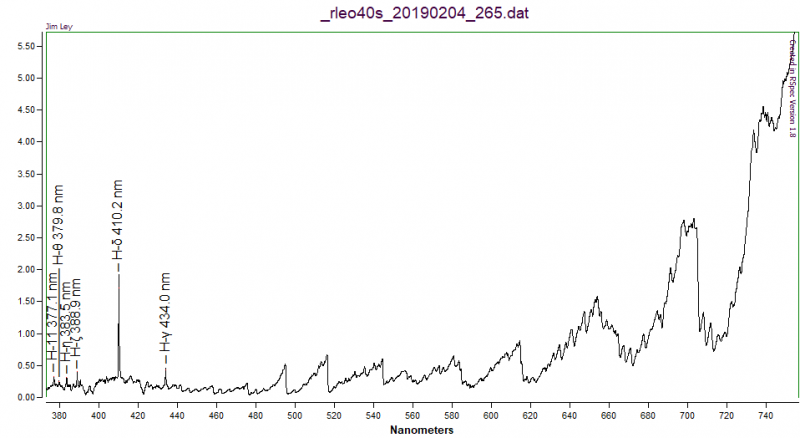 In general the resolution has gone from ~550 to ~1100 and there are some cases where this makes a noticeable difference in what one can observe in a spectrum. 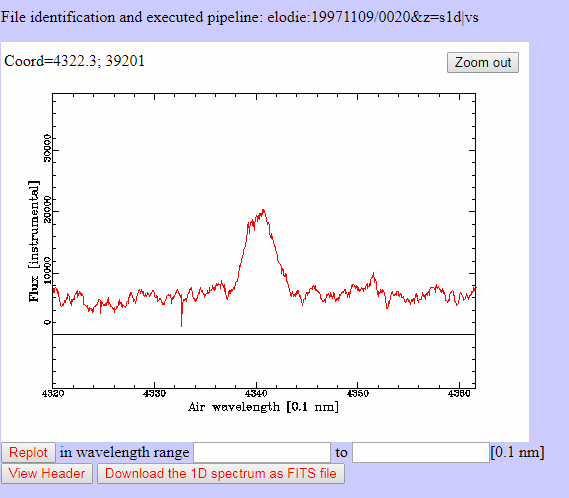 This is the resolution of the spectrograph on objects which completely fill the slit ie as measured using the calibration lamp. When you measure stars with your short focal length setup with a 23um slit the resolution is defined by the star image size which is smaller than the slit, provided there are no tracking errors. 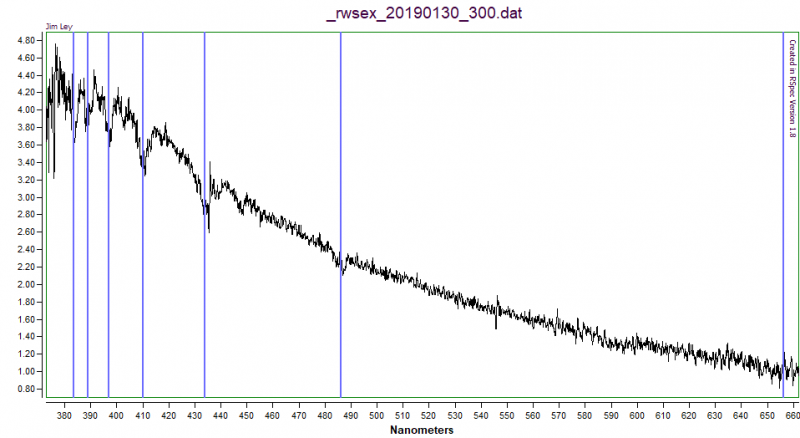 This is why you are generally seeing approximately the same emission line widths with the wide and narrow slits. ie the resolution on stars is approximately unchanged with your setup with good seeing and guiding. I do think that the spectra of planetary nebulae show off the resolution nicely. The light of the extended object fills the slit completely. I don’t think I ever took any spectra of PN with the 23 um slit to compare. I also don’t think that I took spectra of such faint objects so I can’t directly compare the effect of slit size on light pollution. I thought the narrow slit would be less contaminated. Here's another target that surprised me. I knew that the lines of Wolf-Rayet stars were broad due to fast winds, so I didn't expect improved resolution to show me much. 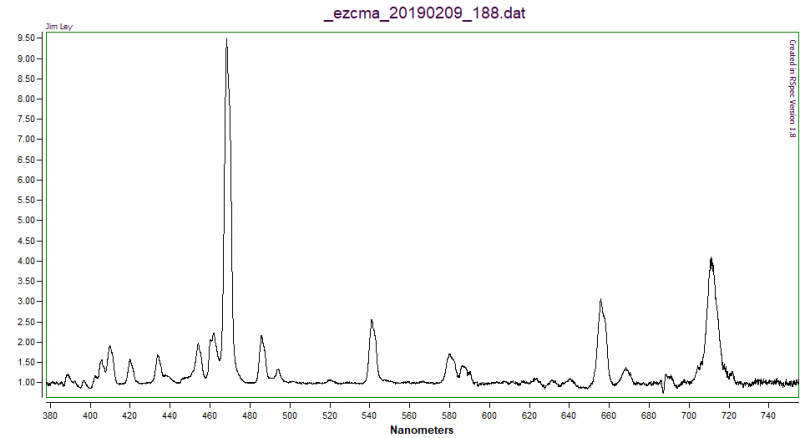 I used 17 Cma to get an instrument response for this spectrum of EZ CMa. The very bluest portion probably shouldn't decrease like that. It's the best I could do. I really had to shorten the exposure time to avoid saturatiing the He II line at 468.6 nm. This is the normalized spectrum that I made by dividing by a smoothed continuum. Can ISIS do that? A quick search of the literature revealed a paper by Flores et al. 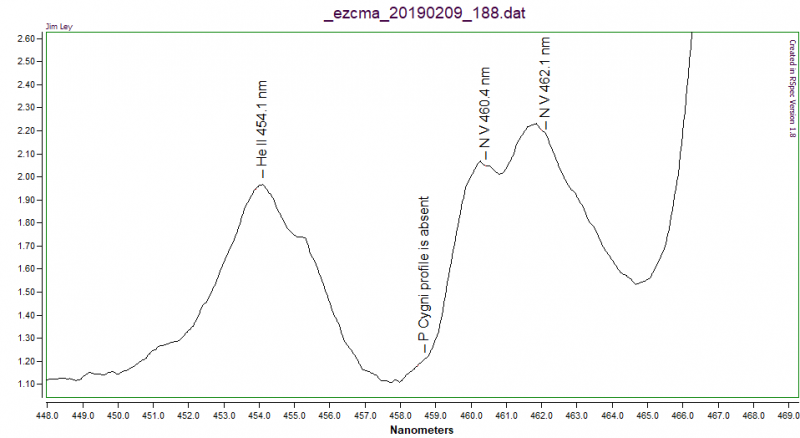 that investigated the wind structure of EZ CMa by analyzing the P-cygni profile of the doublet peaks for N V at 460.4 nm and 462.05 nm. They found this absorption varied between absent, weak and strong. I found that my spectrum was similar to theirs. I could clearly see the doublet. Apparently the P-cygni profile is absent in my spectrum, but I will try again at another time. 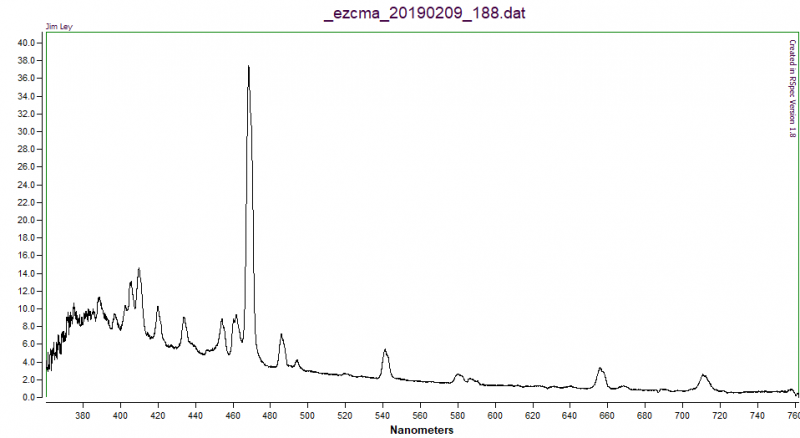 I don't think I would have had the confidence to look for such details with my 23 µm slit. Display the profile in the "profile tab", select "continuum". Manually tune the spline fit using the slider or chose one of the two automatic fits offered. I check out classical Be stars whenever I can. (I probably should learn how to do it properly and contribute to some databases). Omega Orionis had a surprise for me. Hα was clearly visible in emission from the ring surrounding this B3V star. Unfortunately, with my low resolution system, I was unable to see that this peak was split into two peaks. But I was pleasantly surprised when I checked out the Hß absorption. I could barely see twin peaks at the bottom of the absorption. If my understanding is correct, the Hα and Hß emissions actually probe different parts of the circumstellar ring, with Hα (lower energy) coming from regions further from the star and Hß (higher energy) coming from regions closer to the star. The disk is best modeled by a viscous Keplerian decretion disk (matter is thrown out in a Keplerian orbit). It makes sense that the speed is greater closer to the star and therefore the splitting due to doppler shift of the Hß peak will be greater than at the Hα peak. Fascinating. About a month ago I upgraded from my first ever imaging telescope 6" f/6 to 8" f/4. Sadly, I think one would have to double the aperture or more to be truly impressed by the difference. I haven't really run many true head to head comparisons, but the system does seem slightly more sensitive. Probably because of the slightly shorter tube and more balanced weight, my guidance is a little better (often below 0.5 arcseconds RMS). I've also started experimenting with higher gain with my CMOS camera. This is a bit of a pain because I felt I also need separate bias, darks and flats with the higher gain setting. When I can saturate the camera in a reasonable time I still use lower gain, but for faint targets, when I fill less than 30% of the well depth, I can use the higher gain and I think I increase dynamic range and slightly decrease the read noise. The spectra are more noisy than those taken with lower gain, but for faint targets this is a sacrifice I'm willing to make. I think I also might sacrifice some S/N in order to get spectra of more objects. A bigger slit would be better for fainter objects, but it's easier to change the gain on the camera than to change the slit on the spectroscope. 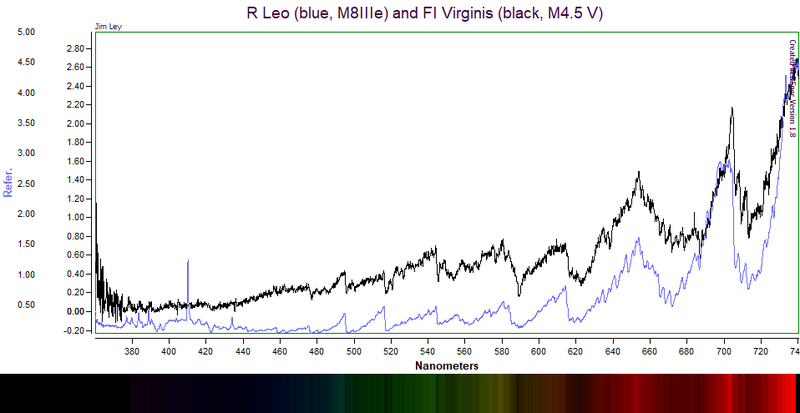 Here's an image comparing R Leo, an AGB mira-variable near maximum light (relatively bright mag ~6 taken with low gain, 10 x 60 s) compared to Ross 128 (FI Vir), a main sequence M star 10.9 light years from Earth (relatively dim mag ~11.1 taken with high gain, 11 x 600 s). Interesting to see the low ionization metals that are visible in the main sequence star that aren't so obvious in the AGB red giant. 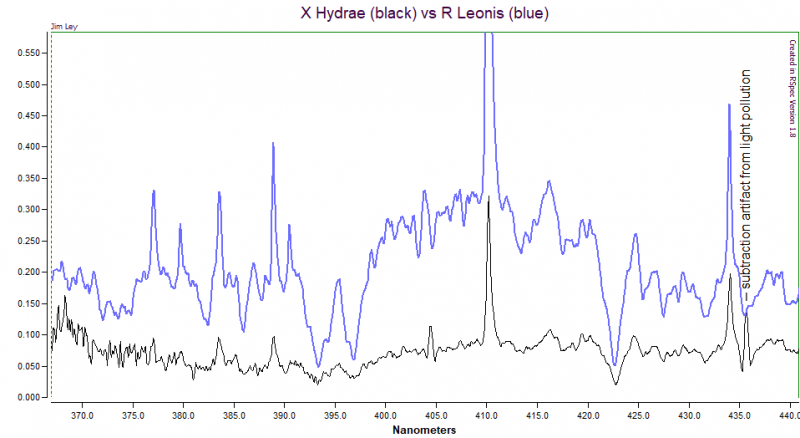 The emission lines in R Leo are caused by shocks created by the pulsating star. 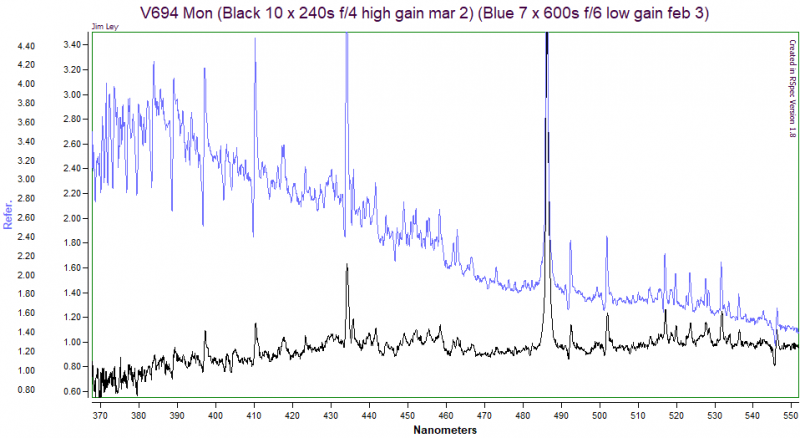 They make for fascinating spectroscopic targets. I have read that FI Vir is an "old star" so I was surprised to see that it seems to have TiO just like R Leo. Where did that come from? Obviously this isn't a controlled head to head comparison, but it's consistent with my experience so far that the higher gain spectra look "noiser". But it can result in substantially lower acquisition times. I think the long acquisition times may complicate my instrumental response for V694 Mon, so maybe the higher gain is better? This system was obviously evolving over the time these two spectra were taken so again, it's not a fair comparison, but the reduction in acquisition time is appealing. I've just discovered your thread which I'm reading with interest as I'm just starting out with astro-spectroscopy with some home made kit. It seems to me you should have got a reasonable improvement moving to 8" aperture. The ALPY should accept light at f4 and the diffraction spot shouldn't be limiting with a 10um slit. So its reasonable to expect 75% more light and thus 75% more SNR which means you should be able to get the same SNR in a third of the exposure time (other things being equal). That's nice to have but I guess its only 0.6 in magnitude terms. Its difficult to tell from pictures but you may benefit from a little more smoothing of the data. 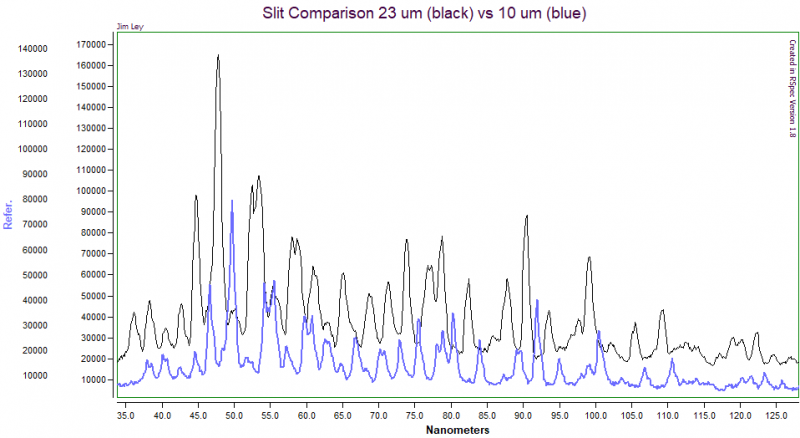 If you have many more than 2 pixels per optical resolution element then smoothing improves SNR without degrading spectral resolution. 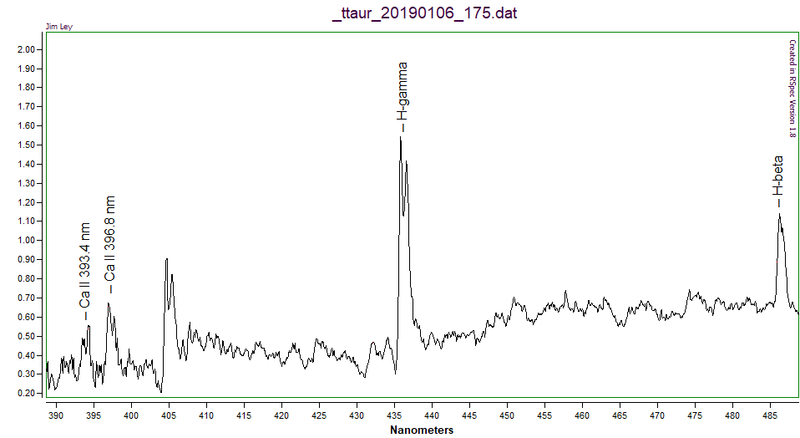 Just for comparison on a different (but similar) system: the attached spectrum is a Wolf-Rayet hip113569 which is ~Mag 11. It was taken with my 8" scope and 2 x 320sec exposure. Of course its difficult to make direct comparisons with different slits, camera, resolution, type of star, etc but it gives an idea.